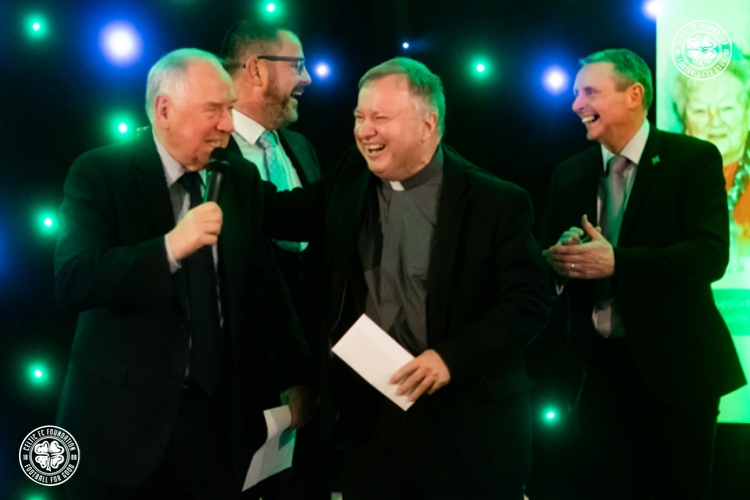 CELTIC FC Foundation’s Annual Sporting Dinner took place on Thursday night at Celtic Park – sponsored by IBC Wealth - and the sell-out event proved to be our most successful to date, with an incredible amount in excess of £105k raised. 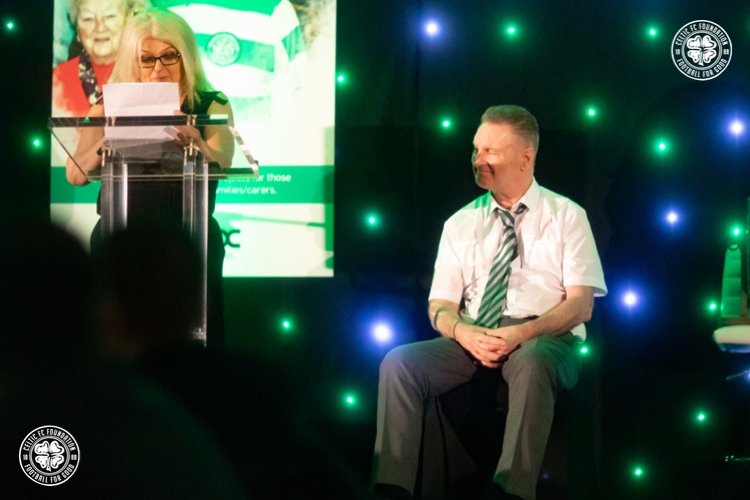 MC for the event was Peter Martin and, after a video piece highlighting the work of the Foundation, he hosted a Q&A with three members of the first-team squad – Kieran Tierney, Callum McGregor and Jonny Hayes. This was followed later in the evening by a fantastic video piece with messages of support from the full squad. Celtic Chairman, Ian Bankier then formally welcomed guests to the event. 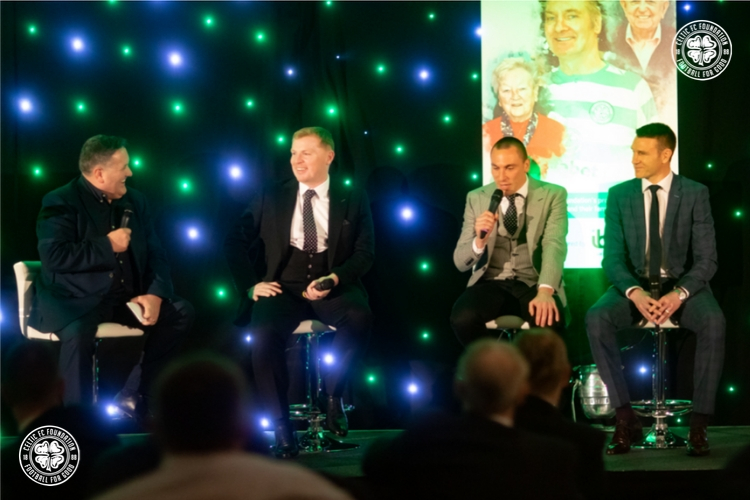 Following a superb three-course meal, those in attendance then enjoyed a magnificent Q&A session, hosted by Peter Martin, featuring manager, Neil Lennon, Scott Brown and Stephen McManus – the most recent club captains. They shared special memories from their respective careers and a common desire to continue to bring as much success as possible to the club. Asked about their favourite European memories at Celtic Park, Neil and Stephen both opted for the 1-0 victory over Manchester United in November 2006, which saw the club proceed to the knock-out stages of the UEFA Champions League. Shunsuke Nakamura scored a stunning free kick from 30 yards, in the 80th minute and Artur Boruc saved a last-minute penalty. It was a magical night under the lights at Paradise. Scott went for the close encounter with Shakhter Karagandy in August 2013, when the Bhoys triumphed 3-2 on aggregate, follow a 2-0 defeat away from home. James Forrest's stoppage-time strike took Celtic into the UEFA Champions League group stage, and the celebrations both on and off the park will live long in the memory. As the trio left the stage, they received a wonderful ovation and best wishes from every guest for this weekend’s Glasgow derby, as well as for the remainder of the season. Tony Hamilton, Celtic FC Foundation’s Chief Executive provided a note of thanks and this was followed by a video piece featuring the Foundation’s dementia care projects. The ever-popular Andy Cameron hosted the auction and prize draw, entertaining guests as only he can, and as he has done for many years at the Sporting Dinner. Just before the second half of the auction, guests heard from Morag Grieve, whose husband Willie was diagnosed with dementia at the very early age of 55. Willie joined her on stage to share their story. It was heart-breaking, honest, poignant and emotional, and touched the hearts of everyone in the Kerrydale Suite – dementia is such a cruel condition but the fighting spirit of the Grieve family is so inspiring. The evening also included a complimentary drink for each guest courtesy of club sponsor, Magners, and there was a silent auction. Following 2017’s #LionsLegacy fundraising campaign, Celtic FC Foundation now operate initiatives in Glasgow and Edinburgh. Linking up with The Eric Liddell Centre, our ‘Liddell Lions Lunch’ operates at the centre’s Community Hub in Edinburgh – and for participants and carers, the project triggers positive impacts on health and wellbeing to encourage improved social interaction and behavioural stability. Similarly, we work alongside Alzheimer Scotland on a separate ‘Lunch Breaks’ project, hosted at Celtic Park. These projects will be the main beneficiary of the funds raised at the dinner, allowing us to maintain, develop and enhance our current provision. Celtic’s Chief Executive, Peter Lawwell, said: “Thursday night was another tremendous occasion for Celtic FC Foundation. I would like to thank all those who contributed to such a hugely successful event, raising a wonderful amount to support our initiatives, and helping those in need. “The work of the Foundation is fundamental to everything we do and the funds raised will allow us to continue to make a positive difference to the lives of so many more people. "Our work in supporting people with dementia has been ongoing for some time and we are delighted that, through Thursday night's event, we will develop this further, helping so many deserving people and their families who are affected by this terrible condition. "This area and many others will continue to be our focus as we continue the very important work of the Foundation." Tony Hamilton added: “Thursday night was another special occasion for us. The support we get from so many individuals, organisations and club staff and directors allows us to continue to deliver projects, such as dementia care, which make a significant difference in people’s lives. The Annual Sporting Dinner is a flagship event in Celtic FC Foundation’s fundraising calendar and its success, once again, is due to the phenomenal support received from IBC Wealth, table holders, guests, auction and silent auction bidders, prize donors and all of those who gave up their time to support our work around dementia care. To register your interest in our 2020 Annual Sporting Dinner, please email cfcfoundation@celticfc.co.uk or call 0141 551 4321.